On February 14th, 2010, the 2010 Vancouver Winter Olympics were opened and the Winter Games began. It was the first and probably only time in my life that I had seen the Olympics and it was in my hometown. I had been living in Tokyo for well over 4 years and with the Olympics in my hometown, there was no way I was going to miss it. 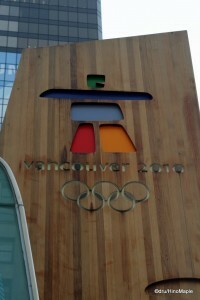 I made it back to Vancouver a day before the opening ceremonies and I left a couple days after the closing ceremonies. My only regret is not being able to see the Paralympics and doing a lot more while I was there. 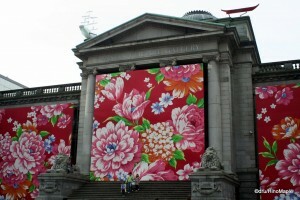 The city of Vancouver was completely transformed during the Olympics. In the build-up to the games, there was a lot of skepticism, and many local people were against the Olympics thinking it would be a complete waste of time. From the beginning, I was all for the Olympics and really enjoyed the idea of having a huge party in my “backyard”. When I arrived at YVR, the nickname and airport code for Vancouver International Airport, I could somewhat feel the excitement. It wasn’t extremely apparent, but the number of Canadian flags was somewhat more pronounced. It wasn’t until I passed immigration control that I really started to feel the Olympics. I arrived on the same day, but a little after a lot of the Russian athletes arrived. Most of them were waiting for their bags to come out onto the carousel. When I exited the secure area and entered the lobby, I could definitely feel the energy as there were dozens of reporters, almost all exclusively with Russian media waiting for the athletes to exit. The entire lobby had roughly 3 times more people than I had ever seen in my life of passing through, and I had been through that lobby countless times. I had a quick reunion with my mother before we left the airport and headed to my home. 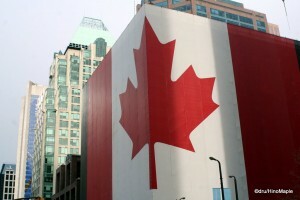 The largest flag in the world, draped around a building. The first thing I noticed when I exited the airport doors and headed to the parking lot was the sheer amount of Olympic activity. Of course I was expecting this, but there were so many people holding “Visa”, the company, signs and people directing travellers on where to go and what to do to get out of the airport. It was amazing to see the amount of people helping others. The energy when arriving is truly indescribable. You must be there to experience it. When we left, I was filled with the same nostalgic feeling of returning to your hometown. If you have never left home, it’s akin to returning to an old neighbourhood. It feels extremely familiar, yet different. The air was clean, especially compared to Tokyo, and the sun felt brighter. Things seemed bluer. When driving away from the airport, you are greeted with the 5 Olympic rings on the side of the road, roughly 2 stories high. It’s quite a sight and one of the biggest signs that Vancouver had changed. I was also surprised by the number of Canadian flags that were adorned to each and every car. I would say over 50% of the cars had at least one Canadian flag. It didn’t hurt that car flags are very popular, especially with hockey during the playoffs. The buzz was definitely felt. 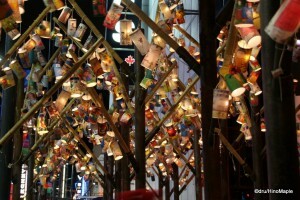 Beautiful lanterns made by kids. My home is within the city of Vancouver, but closer to the airport. I live outside the downtown core, so the feeling that the Olympics were in town was different compared to anyone living downtown. Around my home, there was a feeling that the Olympics were in town, and many homes had Canadian flags, or other country flags hanging in the windows. It was also common to see the Olympic fleet, a set over 4600 different GM brand, and associated brand, cars were on the streets. It’s impossible to walk or drive down any major street without seeing a silver or white car with a 2010 Olympic logo and various Olympic designs on it. Then there are the buses. Thousands of buses were used to shuttle hundreds, if not thousands of people as part of the media, athletes, and athletes families. It was amazing to see how many buses came from out of town to help out in the transportation effort. When travelling outside the city of Vancouver, things tend to quiet down considerably, but within every bar, and most shops, you will always see something Canadian or 2010 related. The real craziness occurs when you enter the downtown core, or the immediate area surrounding it. 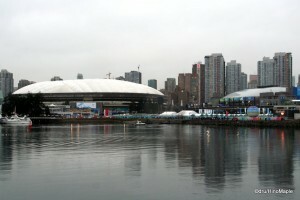 During the Olympics, the area around False Creek and all of downtown extending to Chinatown was in Olympics overdrive. You couldn’t walk down the street without someone cheering, someone in red, or seeing a maple leaf. The entire town was full of Canadian pride. There had been stories about how the “Humble Canadian” was no longer humble, or no longer polite. While this is true, we do have a lot of pride in our country. There were dozens of free places to enjoy and there were a lot of things to see and do around this area. It felt like the weekend everyday, and there was a party every night. It was borderline chaos, and there were many protesters out in force for a few days leading up to the Olympics, and for the first few days of the Olympics. By the end of the first week, there was very little, if any talk about protests. Thankfully, the protests were violent only once, and it was cleaned up so quickly, that by the next day, you couldn’t tell what had happened. There was also a sense that the people in Vancouver really didn’t care about the protesters anymore. They were a nuisance and they were now the enemy, vilified by the few bad apples, and by the crying children who were upset that they couldn’t enjoy themselves in the party. The only other dark side to things were the violent party goers, but this was quashed very quickly by the police who were visible on almost every corner. It was difficult for any roughhousing to happen and get out of control. There were several venues throughout the Lower Mainland that had parties. A couple of major cities had set up party sites and in the downtown core there were roughly a dozen sites for concerts. There was a concert every night and most of them were free. It was extremely popular and you had a tough time choosing where to go for which party. It was also a great chance for Canadian artists to get recognized and to show the world how great Canadian music is. There were also many pavilions where you could learn a little, or a lot, about different areas of Canada, Russia, and other parts of the world. Each pavilion was different. As I mentioned, some of them had concert stages where bands would play local music. They also had local food, and depending on the place, there were different activities. One of my biggest regrets was not seeing some of the more popular pavilions, but I saw the one that I had to see, the Royal Canadian Mint Pavilion. This was a very popular one where the line stretched for up to 7 hours at some points. It was crazy, but well worth it for me. I didn’t spend 7 hours waiting, but I did wait for roughly 3 hours. I waited in line to be able to touch the Olympic medals. For the first time in Olympic history, the medals were available for viewing, and you could actually touch and hold an Olympic medal. The weight of each medal was impressive, and the fact that you can learn and appreciate it is very different in person. Before I could touch and feel the medals, I couldn’t fully appreciate how artful each medal is. Thankfully, I had the opportunity to hold the medals and it is something that I will never forget. The only other free event that I wish I could have tried was the Ziptrek line. It was a free ride that took you on a trip that spanned over 100 metres at roughly 60 metres above ground. You clipped into a harness and special rope and glided down the rope from one side of a square to the other. It took roughly 30 seconds to get there, but I heard it was a tremendous experience. Unfortunately, the lines were at least 5 hours long, and at times 7 hours, so I didn’t bother to wait. It was too crazy and I had better things to do with my time. I do wish I had more time to explore and see more of the regional houses, but that’s the price you pay when you have the Olympics and you don’t visit the different areas every single day. You can miss out on a lot. This is Part I of a two part series. To continue reading about the 2010 Winter Olympics, please head over to Part II. 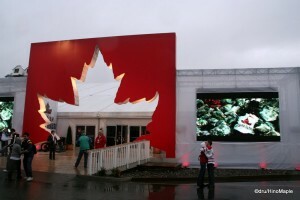 This entry was posted in Canada, Olympics and tagged 2010, 2010 Olympics, Buick, Canadian, Canadian Flag, GM, hockey, Maple Leaf, Olympic Medals, Olympic Rings, olympics, Pavilion, rings, Royal Canadian Mint, Royal Canadian Mint Pavilion, vancouver, Vancouver 2010, Vancouver International Airport, Vancouver Olympics, Vancouver Winter Olympics, Visa, Winter Olympics, Winter Olympics 2010, YVR by Dru. Bookmark the permalink.